Honey is a delicious, sweet food that many homebrewers come around to dream about using in their beer recipes. Brewing a honey beer at home is tasty and fun. This post has information about brewing beer with honey and how to best incorporate it into your homebrew recipe. Since honey is almost totally fermentable, all the sweetness that you perceive in honey in its natural form will be converted by the yeast after fermentation. Adding honey later in the brewing process will help you to retain more flavor in the finished beer. Another good reason to add honey or any large amount of simple sugars later in the brewing process is to drive your beer’s final gravity closer to where you want it. A large amount (defined as 2 pounds or higher) of honey added during the boil may cause your beer’s final gravity to be higher than expected. Your yeast will feed on the simple sugars of the honey first, then turn to the maltose provided by the grains. If there are too many simple sugars, the yeast may get tired out and may not be able to ferment as much of the complex sugars as expected. A successful way to add a large amount of honey to your beer large is to add them after about 4 days of fermentation. Let the yeast work away at the maltose first, and then give them simple sugars for dessert. This way you’ll still make your target final gravity. Honey is fairly voluminous so it may be difficult to transfer into your primary fermentation vessel. Try warming it while it is still in its container in a water bath with a temperature of 100° F or 38° C for around 30 to 45 minutes. It should get into a less viscous state and should pour easily into your fermentor. Beers brewed with honey can have a thin body if the yeast is successful in fermenting it completely. You can combat this issue. If you are an all grain brewer, mash your grains at a higher temperature around 155° F or 68° C. Extract brewers can use some maltodextrin (half pound) to increase the body of their beer. Learn about my plans to add honey to the secondary. I love using honey – but adding it prior to fermentation just increases your OG and adds some dryness. Try using Honey Malt if yo uare looking for sweetness, but not more than 20% or so of the grain bill (depending on the strength you want). I’ve used both method and am a huge fan of honey malt. After primary is also good and you can even add it to the keg or bottle if you like. Thanks Rob. I think your comment and Mike’s answer are pushing me towards using honey malt as my “honey” ingredient. A friend and I brewed a “honey brown” for my first home brew about 12 years ago. He was teaching me how to brew, and decided we should add some honey and do an experiment. We added about 4-5 lbs of honey, along with the standard amount of malt extract, which was about 7lbs or so. Well, the fermentation was extremely active and I even had hops glog the airlock and blow the lid off of my plastic fermentation bucket. That was a crash course in blow-off, literally. : ) The ale turned out okay after all, but it was incredibly strong, probably close to 10%. For flavor, the honey extract is your best bet thought, I didn’t notice much flavor from the honey in my brew, but did notice a dryness, as Rob mentioned. It was a killer brew though. A friend and I just recently brewed a Honey Pale Ale and added 2lbs. of honey just after the boil before adding to the primary. This resulted in a high abv and a dry taste to the finish of the beer. All together it was a great beer though, but I would reccomend adding the honey a few day after the primary fermentation has begun. It will allow for more of the hoeny flavor to come out in the beer and should not affect the gravity or abv nearly as much. 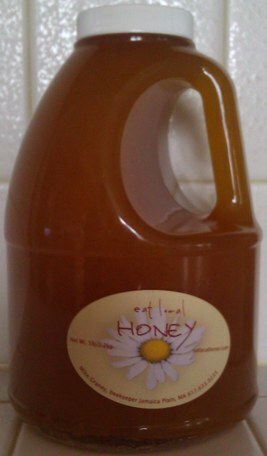 I have never had a problem adding honey to a batch and it always comes out great ! I use a can of malt/a bag of dry malt/ and add hops and or diced up ginger root/ at the end I usually put in 1 or 2-pouinds of honey and 0ne pound frozen raspberrys to the last 5-minutes of the boil. my beer lasts for 3+ years and it gets even better with age !!!! I try to use honey all the time!!!! I am a beginner “home brewer”, just finished my third batch and decided to experiment with honey before researching. I used just ONE measured cup of real, off the store shelf honey and did not do anything with the honey before dropping it in. I put the honey in directly after the boil/cooling down phase, I then aerated and added the dry yeast…….. MY QUESTION is, do I need to give up and throw out this batch?? Since I did nothing with the honey from the store, will this ruin the whole batch??? Please reply to chestypuller1961@gmail.com if you have any advice…..thanks!!!!! We told Joe his batch should be fine. I’m keen to try dropping some honey into my next Pale Ale kit, I’ve read about people home pasteurizing their honey instead of boiling it to keep the delicate honey flavors in final product. It sounds like a bit of work but I really want to taste the honey in the beer, a bit like a Beez Neez. John thanks for letting us know what was happening with Joes brew, I was curious. Good luck Luke. You can pasteurize a honey water solution at a lower temperature. It just takes longer to do. I’m not a beer brewer but I am a master beekeeper. I was reading the comments about adding honey to beer during brewing and read various discussions of the antibacterial properties of honey. Just for clarification, honey has no antibacterial “agents”. However bacteria do not live in honey because the honey has a moisture level of 18.6% or less while bacteria are over 90% water. So……..if bacteria is introduced to honey the water quickly moves through the membrane of the bacterium into the honey – thereby killing it. Water will always move from an area of greater concentration to an area of lesser concentration if the membrane between the two areas is permeable to water. Since the membrane of the bacteria is water permeable it flows out into the honey. Losing most of its water kills the bacterium. That’s why honey is commonly used in wound healing in many parts of the world. Thank you all for your contributions. They are all very insighful. The discussion here as been mostly about when and in what form the honey should be added. I am also curious about the amount of honey (say for a 5 gallon brew) and what type of malts and hops are best paired with honey as well. I am determined to master a honey recipe with the thought of eventually distributing commerically because I am such a fan of honey beers! Try one pound in your next 5 gallon batch as a starting point. You’re going to need at least that amount to get some flavor into your beer. Go for it and take notes of the finished product. Save a bottle and brew it again with more or less honey. Good luck and brew on!